In November, MAKESHOP hosted the first ever Youth Maker Night. 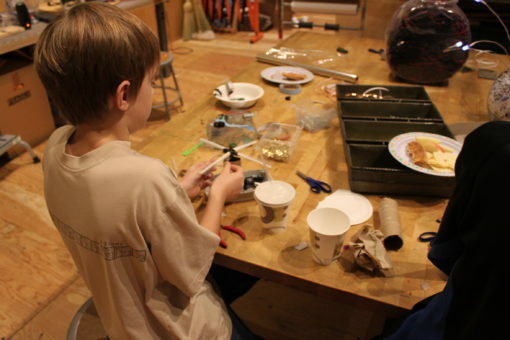 Kids, ages 10 to 15, were given the opportunity to visit MAKESHOP after hours without their parents. We had a lot of electricity activities for the youth to make things and explore. The circuit blocks were out with some conductive play-doh. We also had LED lights and conductive tape, and the youth were allowed to make things using batteries and motors. They also helped us to further prototype light painting. Oh, and there was pizza and music, too! The group of kids that came that night were so much fun to hang out with and make things. Two of them had never visited the Museum before, and the rest of the youth were frequent visitors. Everyone had a really good time tinkering with electronics while enjoying the snacks and pizza. There were some very interesting creations that night. A spinning LED board, a flashlight, some light up cards, and one really, really big circuit. I wasn’t sure how the night would go. The youth seemed to really enjoy the fact that they were allowed to be in the Museum without their parents. It was also evident that they enjoyed using the space without having younger children there. Our next Youth Maker Night will be in January. Be sure to check the Museum calender or email us for more information!